In this Photoshop tutorial, we're going to look at everything you need to know to create and work with custom shapes in Photoshop. There's a lot to cover, so we're going to break things up into two parts. In Part 1, we'll look at how to create a shape, how to define it as a custom shape, and then how to call it up and use it whenever we need it. In Part 2, we'll look at how to collect and save multiple shapes into custom shape sets! I came up with the idea for this tutorial after looking through a scrapbooking magazine recently and coming across pages and pages of simple, ready-made shapes, all packaged together neatly into different themes, that people could buy for ridiculously high prices, and I immediately thought, "Hey! You could create these shapes in Photoshop for, like, FREE!". You don't need to be into digital scrapbooking, though, to benefit from knowing how to create your own custom shapes. For one thing, creating them is just plain fun! Creating a whole bunch of them and collecting them into different sets is even more fun! You can use custom shapes as decorations in digital scrapbooking pages, but you can also use them in professional design work. Or combine a custom shape with a vector mask to create really interesting photo borders! Before we can do any of that, though, we first need to learn how to create them! One more thing I should point out before we begin. Creating custom shapes involves using the Pen Tool. You can create them out of Photoshop's basic Shape tools, like the Rectangle Tool or the Ellipse Tool, but unless you want to limit yourself to creating shapes that look like boxes or bicycle tires, you're going to need to use the Pen Tool. We cover how to use the Pen Tool in great detail in our Making Selections With The Pen Tool tutorial, so we won't be going over all that stuff again here. Be sure to read through that tutorial first though if you're not familiar with the wacky world of the Pen. In this tutorial, we're going to create our custom shape by tracing around an object in an image. If you have a natural talent for drawing and can draw your shape freehand without needing to trace around anything, great! There's no difference between tracing an object or drawing one freehand and there's no benefit to either way of doing it (other than bragging rights), but I personally find it easier to trace around objects (I have no natural talents), and that's what we'll be doing here. The three icons in the Options Bar which allow us to select what we want to do with the Pen Tool. Select the "Shape layers" icon to draw shapes with the Pen Tool. The "Shape layers" option is selected by default whenever you grab the Pen Tool so you probably won't need to select it yourself. It's a good idea though to check and make sure it's selected before you begin drawing your shape. I should point out here that there's no difference between drawing paths with the Pen Tool and drawing shapes with it. Both are created exactly the same way, by clicking to add anchor points, then dragging out direction handles if needed to create straight or curved path segments (again, see our Making Selections With The Pen Tool tutorial if you're unfamiliar with these terms). In fact, regardless of whether you're "officially" drawing shapes or paths, you're drawing paths. The difference is that with shapes, Photoshop fills the path with color, even as you're drawing it, which is what allows us to see the shape. This is actually going to create a bit of a problem for us, as we'll see in a moment. Photoshop fills the shape with the Foreground color as you draw it, blocking the object from view. We'll fix this problem next. Lower the opacity of the shape layer using the Opacity option in the top right of the Layers palette. The object is now visible through the shape color after lowering the shape layer's opacity. The initial shape around the object is now complete. The shape of the object is now clearly visible in the Layers palette. So far, so good. We've traced around the basic shape of the object, and depending on the shape you're using, this may be enough. 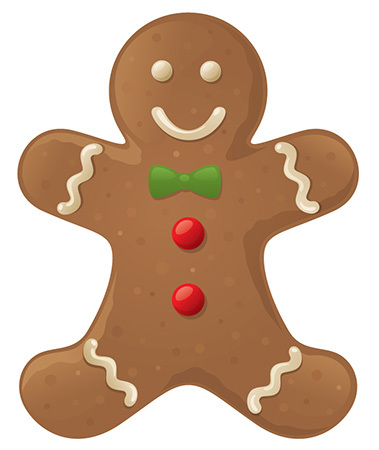 In my case though, my gingerbread man shape needs a bit more detail. 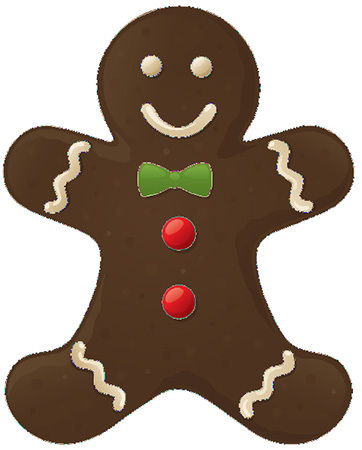 At the very least, I think we should include his eyes and mouth in the shape, and probably even his bow tie and the two large buttons below it. So how do we add these details to the shape? Simple. We don't! We subtract them from the shape! We'll see how to do that next! Click on the Rectangle Tool in the Tools palette, then hold your mouse button down until the fly-out menu appears and select the Ellipse Tool from the list. Click on the "Subtract from shape area" icon in the Options Bar. Dragging an elliptical shape around the left eye. The left eye has now been "cut out" of the initial shape, allowing the eye from the original image below it to show through. Dragging an elliptical shape around the right eye. A second hole is now cut out of the initial shape, creating the second eye. Dragging an elliptical shape around the top button. Dragging an elliptical shape around the bottom button. Both buttons have now been cut out of the initial shape. The shape layer's thumbnail now shows the holes cut out of the shape for the eyes and buttons. 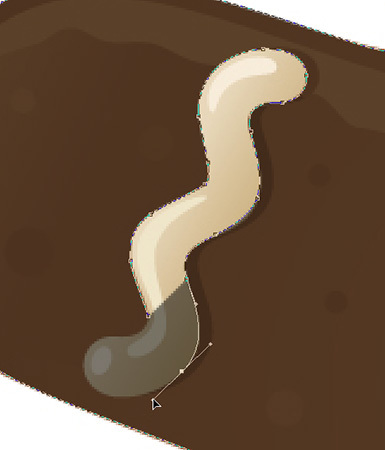 We're going to switch back to the Pen Tool to add the remaining details to the shape next! I'm going to switch back to my Pen Tool at this point because I have a few more details I want to add to my shape that I won't be able to select with the Ellipse Tool. 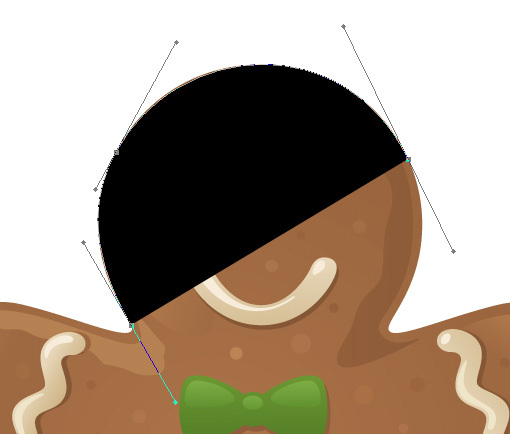 I want to add his mouth to the shape, as well as his bow tie, so with my Pen Tool selected and the "Subtract from shape area" option still selected in the Options Bar, I'm simply going to trace around his mouth and bow tie to subtract them from my initial gingerbread man shape. 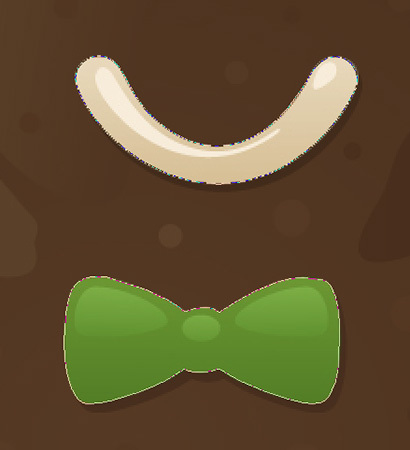 The mouth and bow tie have now been cut out of the intial gingerbread man shape using the Pen Tool. Subtracting the row of icing sugar along his left arm with the Pen Tool. The rows of icing sugar along his arms and legs have now been subtracted from the initial shape. 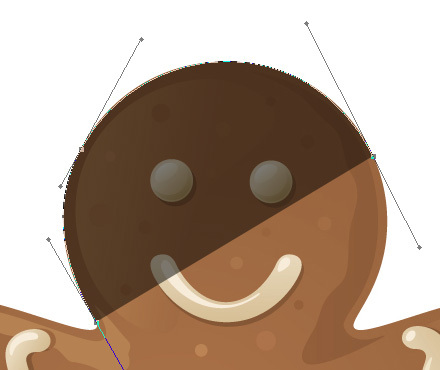 The shape layer thumbnail in the Layers palette showing all the details that have been cut out of the initial gingerbread man shape. At this point, I'd say the gingerbread man shape is complete! We've used the Pen Tool to trace around the outside of him, creating our initial shape, and then we used a combination of the Pen Tool and the Ellipse Tool, along with the "Subtract from shape area" option, to cut out all the smaller details in the shape. Increase the opacity of the shape layer back to 100%. Clicking on the "Layer Visibility" icon for the Background layer to hide it temporarily from view. 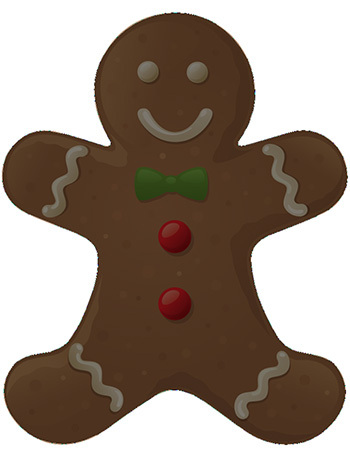 The completed gingerbread man shape, showing against a transparent background. After all that work, we have our shape! We're not done yet though. We still need to define it as a Custom Shape, and we'll see how to do that next! Click directly on the shape layer's preview thumbnail to select it if needed. Note: If you ever need to hide the path outlines around your shape, simply click on the shape layer's preview thumbnail again to deselect it. Enter a name for your shape into the "Shape Name" dialog box. Click OK when you're done to exit out of the dialog box, and your Custom Shape is now ready for action! You can close out of your Photoshop document at this point since we're done creating and saving our shape. Now we're going to see where to find it and how to use it! Click on the Rectangle Tool, then hold your mouse button down until the fly-out menu appears, and then select the Custom Shape Tool. "Right-click" (Win) / "Control-click" (Mac) anywhere inside the document to access the Shape selection box, then click on your Custom Shape's thumbnail to select the shape. With your Custom Shape selected, simply click inside the document and drag out the shape! To constrain the proportions of the shape as you drag so you don't accidentally distort the look of it, hold down your Shift key as you drag. You can also hold down your Alt (Win) / Option (Mac) key if you want to drag the shape out from its center. If you need to reposition your shape as you're dragging, simply hold down your spacebar, drag the shape into its new location, then release your spacebar and continue dragging out the shape. The basic path outline of the shape appears as you're dragging out the shape. Release your mouse button and Photoshop fills the shape with color. We're going to finish things off by looking at how to change the color of our shape, along with how to resize and rotate it, next! Double-click on the shape layer's thumbnail (the color swatch thumbnail) on the left to change the shape's color. 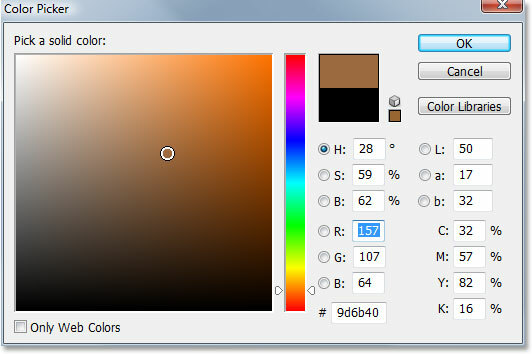 Use the Color Picker to choose a new color for your shape. The color of the shape has now been changed. You can change the color of your shape whenever you need to, and as many times as you want! Resize the shape by dragging any of the Free Transform handles. Click and drag your mouse anywhere outside of the Free Transform box to rotate the shape. Press Enter (Win) / Return (Mac) when you're done to accept the transformation and exit out of Free Transform. Add as many copies of your custom shape as you like to your design, changing the color, size and angle of each one. And there we have it! We've created an initial shape by tracing around an object with the Pen Tool. We "cut out" little details in our shape using a combination of the Pen Tool and the Ellipse Tool, both set to the "Subtract from shape area" option in the Options Bar. We saved our shape as a Custom Shape using the "Define Custom Shape" option in the Edit menu. We then created a new Photoshop document, selected the "Custom Shape Tool", selected our shape from the Shape selection box, and dragged out our shape inside the document. Finally, we saw how to change the color, size and angle of the shape any time we want! That covers the basics of how to create and use Custom Shapes in Photoshop, and that brings us to the end of Part 1 of our "Custom Shapes For Digital Scrapbooking" tutorial. In Part 2, we'll look at how to gather up multiple shapes we've created and save them as Custom Shape sets! Visit our Photoshop Basics section for more Photoshop topics!